Like Piccadilly Circus in London, in Milwaukee the Public Market is the kind of place where if you hang out long enough, it seems like everyone in the world eventually passes by. Considered one of “America’s Best Public Markets,” the Milwaukee Public Market opened in 2005 and offers a variety of one-of-a-kind, high quality artisan & ethnic products, fresh produce and prepared foods, quality meats and surprisingly tasty vegan creations, beer and wine from crafters all over the world, demo kitchens, and even places to pick up fresh-cut flowers and goofy Milwaukee-themed clothing – such as a t-shirt with a bottle opener embedded in it. 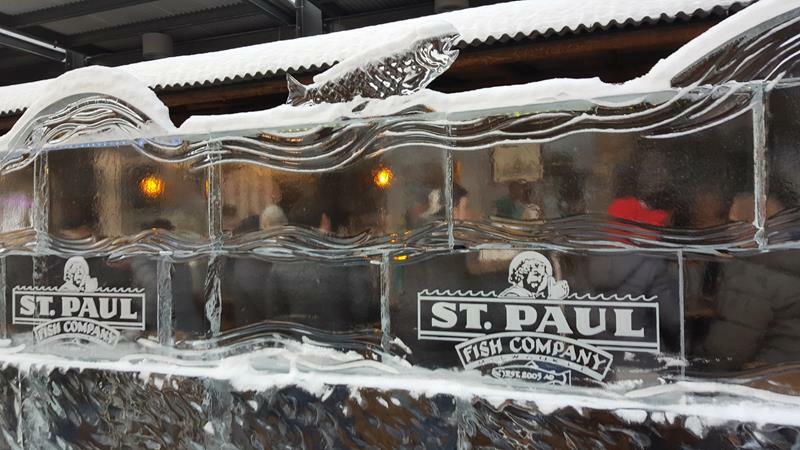 We’re highlighting the Milwaukee Public Market right now because during this cold spell, their Ice Bar that St. Paul Fish Company features along the east side of the building along Broadway (Highway 32) is in full swing and is one of the coolest – literally – things to see right now. Hurry, because it’s melting soon! 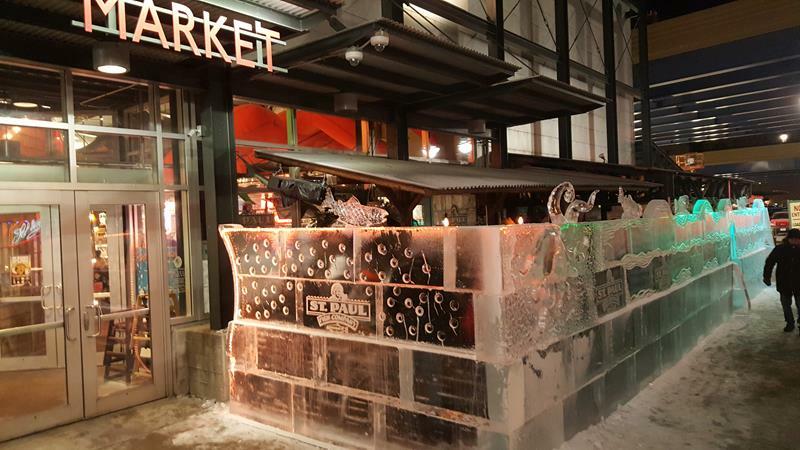 The walls of the ice bar at the Public Market offers a look at what’s inside. And what’s inside is fun! 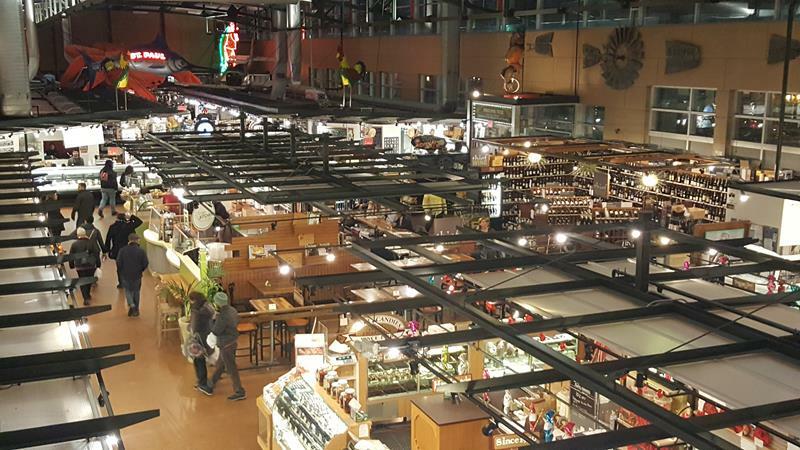 Independent merchants make up the Milwaukee Public Market, an indoor venue complemented by its Outdoor Urban Market along with craft fairs during the summer months. The MPM itself crowns the north end of the vibrant Historic Third Ward neighborhood, right along St. Paul Avenue between Water and Broadway and literally nuzzling up against I-794, under which parking is available. The new Milwaukee Streetcar System, known as “The Hop,” is being constructed along this corner; the Public Market will undoubtedly be a key stop along this new route. Vendors offer a huge variety on the main level, while a seating area, demo kitchen, and more await on the upper level. 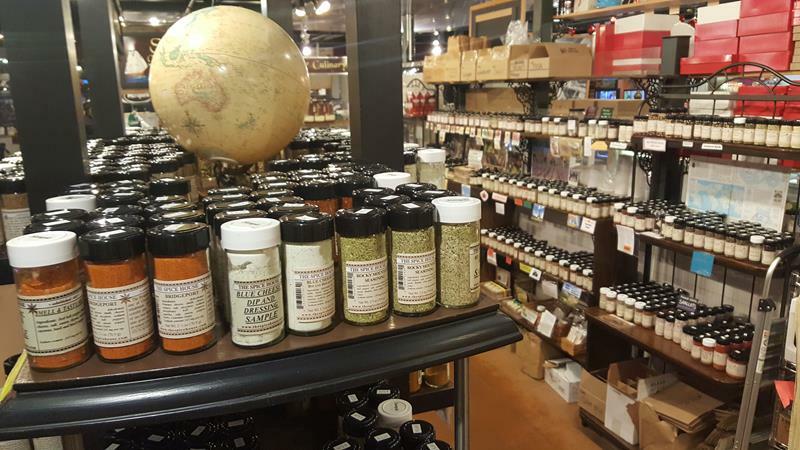 You can get everything from fresh fish at St. Paul Fish Company to exotic spices at the Spice House, prepared soups, scratch-made specialty chocolates – and much more. 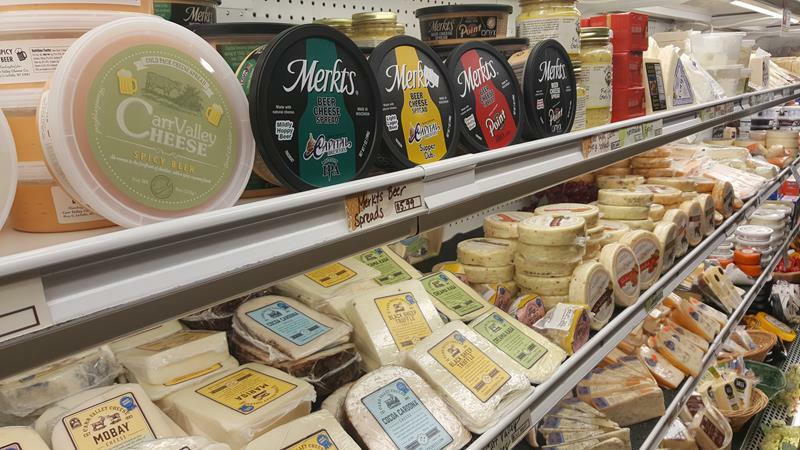 The meat and deli counters at Foltz’s Family Market and West Allis Cheese & Sausage offer anything you could want. For vegans, On the Bus features everything from avocado toast and seitan sandwiches to take-home vegan ingredients for meal prep. Margarita Paradise offers Mexican fare and ingredients; Aladdin has you taken care of on the Mediterranean side. Kehr’s Candy Kitchen is a continuation of a long-traditional shop in the city with specialty chocolates and treats; while C. Adams offers incredible bakery across the way. Thai-namite offers fresh sushi, sashimi and similar fare while the Soup & Stock Market creates new concoctions every way. Bring any food to Thief Wine and sip a variety of wines from around the world at their counter while you enjoy, or peruse bottles to bring home. Brew City Beer Gear covers you with your favorite Wisconsin and Milwaukee t-shirts, hoodies, even socks – with creative messages. Plenty of shops, bars, and restaurants flank the Market in the Third Ward, which has become a prime boutique shopping destination for people from as far away as Chicago. 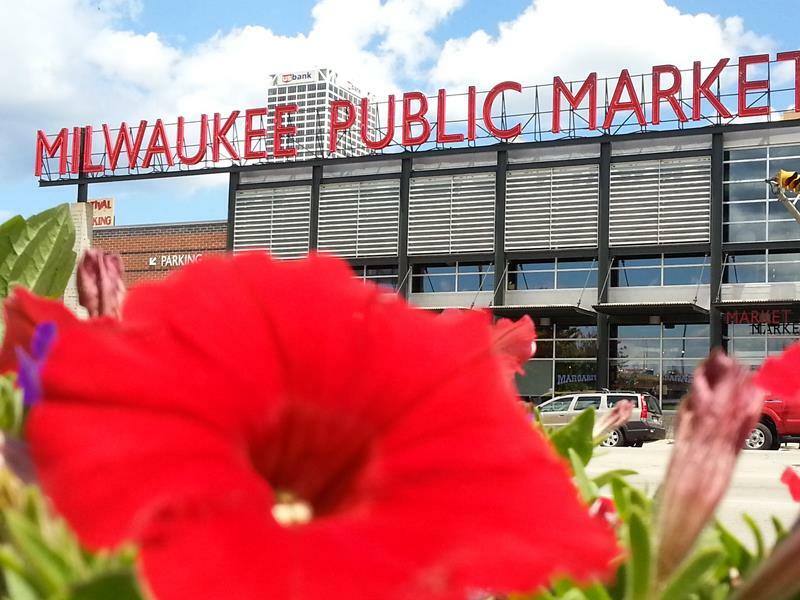 The Milwaukee Public Market is open seven days a week. Hours are 10am-8pm Monday-Friday, 8am-7pm Saturday, and 10am-6pm Sunday. Early morning coffee lovers can grab a fresh cup as early as 7am on weekdays at Anodyne Coffee, and wine enthusiasts can enjoy extended hours until 9pm Thursday-Saturday nights at Thief Wine in the middle of the Market. West Allis Cheese & Sausage offers an amazing array of cheeses, sausages, and cool Bloody Mary combos if you ask nicely. I-794 is one easy way to reach the Milwaukee Public Market via exits to St. Paul or Jackson Street south; Highway 32 flanks its east side as Broadway, U.S. 18/Michigan Avenue is just two blocks north, and Highways 38, 59, and 145 all get you close.